Can cardboard, inflatables and blankets protect cars from hail damage? Many people affix cardboard, inflatables and blankets to defend against a potential hail storm. GRAND PRAIRIE, Texas — It’s a simple question that, as it turns out, has a scientific answer. Does placing household items on your vehicle to protect it from hail actually work? 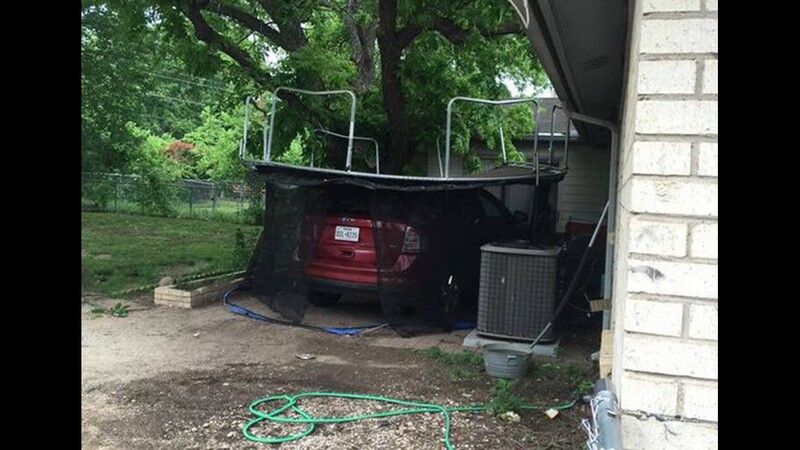 We’ve seen a lot of North Texans affix cardboard, inflatables and blankets to defend against a potential hail storm. So, is it worth your time to take the extra measures before a potential hailstorm hits? WFAA partnered with the TCU College of Science and Engineering and Grand Prairie ISD for a unique weather experiment. Students on the Grand Prairie High School baseball team brought their arms, we brought along a yoga mat, comforter and a pool inflatable -- and TCU physics professor Magnus Rittby brought the science. Texas Auto Recyclers in Grand Prairie provided the 1991 Mercedes coupe as the testing vehicle. The test was designed to simulate baseball sized hail traveling at approximately 85 mph. Most of the baseballs thrown in the science experiment clocked in at 60 to 75 mph, according to the radar gun provided by the Grand Prairie Police Department. In the first test, a two-dollar inflatable repelled each baseball strike. “Cover your car with inflatables, it might work,” Rittby said. The yoga mat provided virtually no protection. Repeated strikes with the mat in place yielded multiple windshield cracks. The final barrier was comforter placed over the passenger window. Repeated strikes didn’t cause any cracks. Rittby says that result has more to do with the driver and passenger window being more difficult to shatter. The larger the hail, the faster speed it falls. “If an inflatable rips or tears, you’re back to having no defense,” Rittby added. "But it's better than nothing." Luckily for us here in Florida, the hail isn't usually baseball sized but it can still make a dent. According to State Farm Insurance, there are approximately 3,000 hailstorms in the U.S. every year, causing billions of dollars in damage to buildings, vehicles, and crops each year. In 2018, State Farm paid more than $2.7 Billion for more than 280,000 auto and homeowners insurance hail damage claims. In Florida, State Farm paid over $19 million dollars. This was the 24th highest total among the 50 states. The top five states with the most paid hail losses were: Colorado, Texas, Illinois, Minnesota and Missouri. Stop driving. If you see a safe place close-by (like inside a garage, under a highway overpass or under a service station awning), drive to it as soon as you can. Make sure you pull completely off the highway. Do NOT leave the vehicle until the hail stops. Stay away from car windows. Cover your eyes with something, like a piece of clothing. If possible, get onto the floor facedown or lie down on the seat with your back to the windows. Do not go outside for any reason. To avoid the danger of electrocution from lightning, avoid using phones and electrical appliances during a severe storm. Visually inspect your home for structural damage, take pictures and if possible, move your personal belongings to prevent further damage. Save receipts related to home repairs, vehicle towing, temporary housing, meals, and other living expenses. Expenses may be eligible for reimbursement after any required deductibles are met.